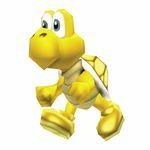 A Gold Koopa is a Koopa Troopa under the effects of a Gold Ring in New Super Mario Bros. 2. They look and behave much like their parent species, except that their shells and shoes are gold. When stomped on, they will retreat into their shell and give the player five coins. When a Gold Shell is thrown, a path of coins will follow it. Whenever a Gold Shell is thrown at an enemy, an increasing number of coins will be earned for each enemy defeated. In Mario & Luigi: Superstar Saga + Bowser's Minions, a gold variant of Captain Koopa Troopa is unlocked whenever the Koopa Troopa amiibo is scanned in the Minion Quest: The Search for Bowser mode. In Super Mario Odyssey, a Gold Koopa appears as one of the Roving Racers. ↑ von Esmarch, Nick. New Super Mario Bros. 2 PRIMA Official Game Guide, page 35. This page was last edited on February 9, 2019, at 12:26.